Shop Yamaha BR15 15 Inch Passive PA Speaker from AMS with 0% Interest Payment Plans and Free Shipping. The Yamaha BR15 is a 400-watt, 2-way main PA cabinet with a 15-inch high power woofer. 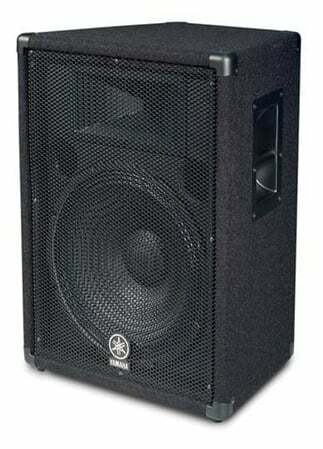 Better Response: BR cabinets are carefully designed for the best balance of small, easy to handle size and great low-frequency response, using Bass Reflex technology. High-frequency response is also enhanced with a 1" new titanium HF driver and 90° by 40° non-resonant horn. Best Reliability: All BR-Series models are covered by a three-year warranty. With integral protection circuitry built into the passive crossover, you can expect a long life of high output and minimal distortion. Whichever model you choose, your message is sure to be heard using BR-Series loudspeakers... and you can take the savings to the bank! BR10 - 250-watt (Program), 2-way mains cabinet with 10" high power woofer. BR12 - 300-watt , 2-way mains cabinet with 12" high power woofer. BR12M - 300-watt, 2-way main/monitor cabinet with 12" high power woofer. BR15M - 400-watt, 2-way main/monitor cabinet with 15" high power woofer. Nominal Dispersion: 90° H x 40° V C.D. Yamaha is the absolute best quality and the best price with AMS! I have an EMX512 mixer and these speakers produce wonderful sound regardless of were they are placed at a gig. They are built to be moved around and stand up to most anything I do with them. Portability and covering work for me with these speakers. Some type of dolly or wheels that I could attach to the bottom of the speakers would be nice when I move in to set up on stage. These speakers come with both 1/4" plugins and Speakon plugs. I can chain two more speakers up easily with no problem. They are simple to use and it doesn't seem to matter how or where I place them, they always sound great. Compared to the other two sets of performance speakers that I have, they are superior. People from the audience continually compliment on the "Sweet Tone" they put out. Two different performers that always come to check my set up for balance before I play really love the frequency range and quality of my Yamaha equipment. I only wish that I had bought them earlier. My wife commented that "your voice sounds so much better" with these speakers. Solid construction, four years of using them out and at home with no signs of wear and tear. Easy setup and use, great value, great sound, built tough. Had a pair them for four years and they show no sign of wear and tear and still sound great. Nothing hard here at all. I hook a speaker cable from one speaker to the next, then another cable from either speaker to the back of the mixer. Nothing to it. I use these speakers with a EMX512SC mixer, an A12M floor monitor, a SW118V sub, and a P7000S power amp. Not an arena sized PA system, but very easy to setup and use, and great sound for its size. Very good for the price. They do a pretty good job of handling highs, mids, and lows at the same time, but I recommend adding a Yamaha sub and power amp for some real oomph. Great Speakers, Loud and Clear! Very well-built, great sound and performance. Well built, sturdy, takes a lot of abuse however after about 1,500 hours of med-full power use bass reflex and sound start to diminish. After 2,000 hours i lost my first speaker(the right one) still half way works but no more bass. Still worth the price. very little, makes things easy. I've been using mine since 2004 with no problems whatsoever . . . ok well except for the fact that my first pair was stolen an hour before my most important annual gig back in February of '07!! But I'm sure whoever has them is enjoying them as much as I did, because I went right back and replaced them with the same exact pair! plug and play, fire and forget . . . The speakers do what they're supposed to. They sound great. I like that they use metal hardware. Plastic is cheap. The carpet covering is cheap and will fuzz up on you and get crap stuck in it. A lint roller can help with that. I don't like how the label is stapled on the back either. They sound great. The main thing is I wish they used a better material for the covering. Plug and go. I hit them with about 500w a piece at 8 ohms and they are louder than i'll ever need them to be. Sweet. Could ask for a little more low end response but that wouldn't be fair. I need to get a sub. Yes! You picked the right one! These cabs look to be very well made. I just got them; Yamaha makes quality gear, so I expect them to last a long time. There's really no features; just plug them in & they kick. Again, just plug 'em in & listen to the music. These speakers sound excellent! Very adequate, punchy lows & the highs are clean, too. If you aren't a total bass-head & plan to rock the block from the ground up, you won't even need a sub. They're perfect for what I need; a great sounding, low-priced speaker. I use these with a Soundcraft Gigrac 600 = sweet set up!